STUDER REVOX A 720 SINTO PREAMPLIFICATORE. USCITE PRE RCA/DIN PER COLLEGARE UN QUALSIVOGLIA FINALE STEREO. A super nice Amplifier by Toshiba from Japan. Quite rare in this condition, with minimal wear, very presentable. Carver C500 Power Amplifier 250 WPC into 8 Ohm. Carver C500 Power Amp refresh. This unit was recently refreshed by highly qualified technical and audiophile person. All functions in full working order, no need for any further intervention. 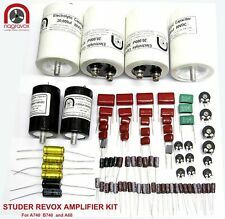 REVOX A68 and STUDER A740 / B740 amplifier - Electronic overhaul service kit. Don’t accept anything less! In defence of the original Rifa and other makes of suppressor capacitors fitted by Studer / Revox to most of their machines and have often been referred to as “little smokers”. EACH TUBE HAS THE L7V OR K7V FACTORY CODE'S. SIX TINY PLATE 12AX7 ECC83 TUBE'S MADE BY SYLVANIA. DID TEST EACH TUBE. Each tube fully tested for strong GM and High quality sound! We will work hard to resolve your concerns and will try to find a fair solution. Power output: 45 watts per channel into 8Ω (stereo). IMPORTANT NOTE;. Year: 1977. Weight: 9.5kg. Output: 775mV (line), 1.5V (Pre out). LUXMAN MQ36 Vacuum Tube Power Amplifier. Released year: 1974. Other information. Weight: 18.7kg. SONY TA-1130 Integrated Amplifier. Released Year:1972. Weight: 13kg. The Classics. A complete edition of the must-have audio files. ・ McIntosh MI-60 Monaural Power Amplifier. ・ 2011/5/26 Release Date. Every product will be tested before we send out. Dual Color LED power indicator. Accuphase E-305 Integrated Amplifier. The MOS FET adopts a good tone and phono equalizer also has a good reputation. The strength of the core which is not in the current product is attractive, and the Integrated Amplifier which has the ability not to be crowded with the separate amplifier. McIntosh Faceplate with Handles and Side Panels for MI-350 Power Amp. One McIntosh MI-350 Faceplate with Handles, no logo badge. 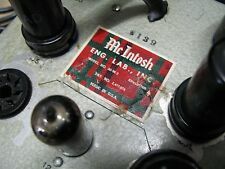 One McIntosh MI-350 left side chassis panel. One McIntosh MI-350 right side chassis panel. Here is a 5 lb. Stamped B Stearine Core, 53 64 Spec AT 7241. An excellent addition to anyone's collection. TEAC A-50 Amplifier. 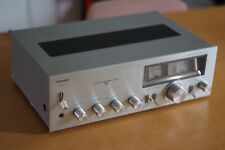 It has the usual connections for an amplifier of this era including a Phono input and the all-important "loudness" button! Power output: 30 watts per channel into 8Ω (stereo). Signal to noise ratio: 66dB (MC), 82dB (MM), 96dB (line). Here is a 3 lb. An excellent addition to anyone's collection. Integral AC outlet as shown. This will make a wonderful addition to anyone's collection. Bulgin SA1393 three pin connector with keyway. THESE AMP USED WITH TANNOY GOLD MONITORS, FSM MONITORS, JBL MONITORS, BOWERS WILKINS, ROGERS MONITORS, KINAP HORN SYSTEM, LOMO SPEAKERS. THESE AMP USED WITH OTHER AUDIO COMPONENT - AUDIO NOTE. Order more than one, Live in the UK, and the others go free. 1980's Black & Aluminium Skirt Knob B. The knob is screw-fit on a 'O' or a 'D' shaft. Released Year: 1983. Other information. S/N: 124dB. Rated Output: 240W＋240W（4Ω）, 200W＋200W（6Ω）,　170W＋170W（8Ω）. Iskra 470R 1/2w 5% Resistor. I used a 274b rectifier tube because they sound like no other. The tubes are very large, old school style, so I had to find a way to fit them into the chassis. The chassis is available in two sizes. Quad II Jones 6 pin to RCA/phono adaptor one pair. Fitted with g old plated phono socket. All components are new and assembled in the UK. They are colour coded one red and one white. The covers are VERY heavy duty. I finish it off with the make and model.or pretty much anything of your choice.embroidered on the front. As you know.dust and sensitive electronics do no not mix. The generator frequency is set via resistor at 1KHz and it should not be beyond anybody’s imagination to change frequency via a variable resistor. Get what you want when you want it, for reasonable prices. 30 18 18 0.83 70 31 2.8 1.2 0.42 0.9. 2.0" x 0.04". Five Pieces RS Components Silver Mica Capacitors. All parts have been checked and are within tolerance. Mating pair of Bulgin P430 and P429 Connectors. 33K 5% - 3 Pieces. 47K 5% - 3 Pieces. 15K 5% - 4 Pieces. The buy it now is for a total of 10 Pieces. All parts have been checked and they are within tolerance. The preset tuning buttons light up green, the red dial indicator for manual tuning works, and the red 'Stereo' indicator works. Pioneer SX-600. Synthesized Stereo Receiver (1980-82). Power output: 20 watts per channel into 8Ω (stereo). DIRECTLY REPLACES = 5672 CV2238 = CK5672 JTL567. HIGHEST QUALITY 5672 TUBE'S EVER MADE. 10 NOS NIB VALVO TUBE'S. MADE 1950'S IN WEST GERMANY. Amazing tubes, about the best I've heard! NO FLAKE'S INSIDE, NO BURN MARK'S, BEAUTIFUL CLEAR / CLEAN TUBE. Erie Type 100 High Stability Resistor. Value 10K 1%.